Allen Mayers negotiates rapids Sunday, July 17, 2016, near the Ocoee Whitewater Center. Mayers was a spectator during the 1996 Olympics. POLL: Did you attend the 1996 Olympics? Olympic athletes from the Chattanooga area say they're putting aside health and security concerns to focus on their individual performances. The voice of Tom Brokaw rang out across the nation early on the morning of July 27, 1996. With sleep in his eyes and a tinge of strain in his voice, the iconic face of NBC News anchored a live broadcast detailing a breaking news story from the Olympic Games in Atlanta with both worldwide and local implications. Just hours before kayak and canoe slalom competitors were scheduled to enter the water for the first day of competition on the Ocoee River in Southeast Tennessee, the unthinkable happened: An explosion sounded in Atlanta's Olympic Village, followed by panicked screams from a crowd gathered for what should have been a celebratory night midway through the Games. The bomb blast left two people dead and injured 111 more. Olympic officials insisted the Games continue that day, with flags at half-staff and moments of silence before events began. So a small stretch of river in Polk County, Tenn., suddenly was thrust into the spotlight for more than just its status as an unlikely Olympic venue. The Ocoee River became a landing place for the eyes of a concerned world, and a place of hope that a sense of normalcy could return to the Games in the wake of unfathomable evil. For two days, the world's premier whitewater paddlers dazzled crowds that exceeded the total population of Polk County in the culmination of a years-long process that brought the Olympics to the remote hills of the Cherokee National Forest. "It was a wonderful experience," Polk County Mayor Hoyt Firestone said. "To hear your national anthem played in that gorge, to have it echo off the mountains and come back to you, it was really a treat." "It was so huge for Polk County," Chattanooga resident Joellen Dickey said. "You're in this gorge, it's narrow, and to have that huge infrastructure put in was amazing. Just to get all the people there, it was incredible." Dickey, who lived in Atlanta in the years leading up to the Games, served as the head of WIN, short for Whitewater in Ninety-Six. 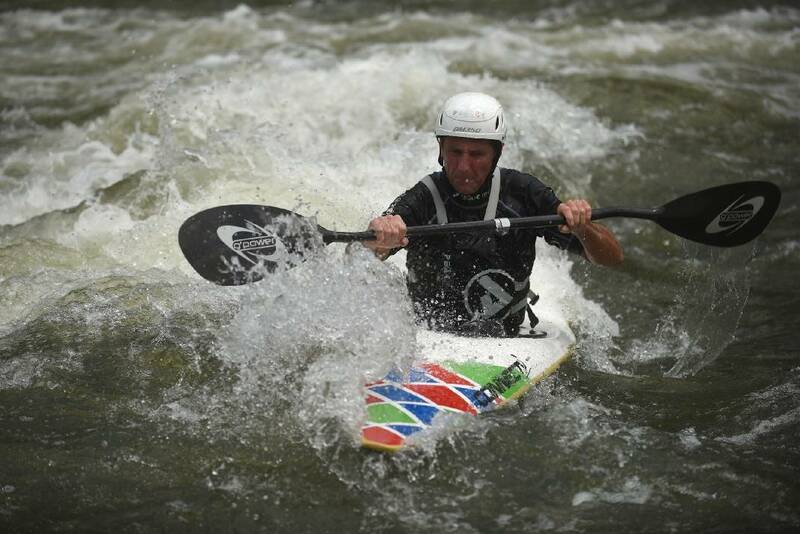 The WIN campaign advocated for the Ocoee River to host the whitewater competitions as uncertainty swirled over whether events such as kayak and canoe slalom would be included in the 1996 Olympic Games. Whitewater events were on the ticket for the 1992 Games in Barcelona for the first time since 1972, but even when Atlanta was announced as an Olympic host in September 1990, the events were deemed optional for '96. A group of leaders in the Atlanta Whitewater Club pushed to include whitewater events before Atlanta was named the host city, but a number of hurdles had to be overcome. The Atlanta Organizing Committee was unwilling to cover the cost of the canoe and slalom events. It took an economic feasibility study by KPMG to sell Tennessee and federal authorities on the idea and show what the area stood to gain from having an Olympic venue. That study "worked bureaucratic magic," according to a 1996 booklet from the U.S. Forest Service that chronicled the Ocoee's rise to the Olympic stage. KPMG estimated Tennessee could invest $10 million and reap as much as $68 million in total benefits between 1992 and 1997. That would create a tremendous boon for an area seeing a century-plus copper mining legacy slip away. "It was an economic development project," Dickey said. "That's what it was all about, and that's why you could convince TVA, the Forest Service, the state, local politicians and so forth to do what they did." The study was presented to the state in 1992. A few months later, Americans Joe Jacobi and Scott Strausbaugh won gold in doubles canoe slalom at the 1992 Olympics in a small town two and a half hours north of Barcelona called La Seu d'Urgell. A crew from the Forest Service and WIN watched and examined every detail of the venue. Seven nations medaled in the four events that the Ocoee was vying for, cementing the international appeal of whitewater as an Olympic sport. With the state behind the idea and no cost to the AOC, the International Olympic Committee announced the Ocoee River as the host site of the 1996 Olympic canoe/kayak slalom competition in December 1992. "The Ocoee solved a lot of issues," said Jacobi, who did not compete in 1996 but bought a home in the Ocoee area and hosted international athletes along with his wife, Lisa. "It made a lot of sense to the people in Atlanta, because it brought in a different revenue source to pay for the venue," Joe Jacobi added. "It gave the public sector an opportunity to make a major economic development impact investment in an area that wasn't even building a highway." Dickey soon started the Ocoee Region Canoe and Kayak Association to prepare the area for its new role as an international athletic venue. The organization landed the 1993 International Canoe Federation World Cup Finals, which were held on the Middle Ocoee while plans were drawn up for a premier whitewater channel on the Upper Ocoee. By 1996, the 7,600-square-foot-Ocoee Whitewater Center was under construction and a team of more than 2,000 local volunteers were seasoned in hosting world-class competitions, as were the dozens of Polk County-area residents who opened up their homes to international competitors as the Games approached. "It was all so well pulled together," said Scott Shipley, a three-time American Olympian who competed in the men's canoe slalom. "If you went in and talked to someone who was a part of the organizing committee or saw the plans at all, everything about it was well done, and it was well done from the start." Jacobi woke up early on the morning of July 27, 1996, to news of the bombing. He had been scheduled to perform a test run on the slalom course before events began. Instead, test runs were canceled and a complete security sweep of all Olympic venues was conducted, pushing the start of the whitewater events back by a few hours. Just before the events did begin, a car backfired on U.S. Highway 64, in the Ocoee Gorge, unnerving a crowd that was initially light and subject to close searches before it grew to 15,000. "It should have been a grand, festive occasion, but the Atlanta tragedy put a damper on the party, affecting fans, officials and athletes alike," wrote Tom Wood of The Tennessean. But the events went on. And as the years have passed, the spirit of competition and patriotism on display at the Ocoee is what has lingered to those who attended and competed. "There was a lot of extra security, of course, because they didn't want some sort of repetition," said North Carolina resident and frequent Ocoee kayaker Allen Mayers. "We got to the venue and it took a long time to get in. But once that was all done, it was a fantastic event." Shipley, who finished 12th in men's canoe slalom, recalled being able to see police cars out of every window as the athletes were transported from their overnight digs at Lee University in Cleveland, Tenn., to the Olympic venue 30 miles east. But his best memory came at the venue. Shipley was the last of 43 competitors in his event to make the run down the river, and the home-country crowd responded accordingly. "Everyone sat and watched everyone race and it was this amazing thing," Shipley said. " I remember looking downstream and I see the entire crowd stand up and start to cheer as I entered the starting gate. That, to me, was one of the most amazing moments at that venue." The best finish from a U.S. competitor came in the women's kayak slalom from Dana Chladek, who tied for gold after dealing with injuries leading up to the Games. Chladek was awarded the silver medal when the tiebreaker favored tpánka Hilgertová of the Czech Republic. Michal Martikan won Slovakia its first gold medal as an independent nation in the men's singles canoe slalom. Jacobi, who returned to the Olympics as a competitor in 2004, 12 years after his gold in Barcelona, still has a home in Ducktown. He said that every once in a while, he'll notice European tourists at the Ocoee Whitewater Center, strike up a conversation and learn they are from Slovakia and visiting the location where their nation's first gold medal was won. "It's so cool to see someone from Slovakia come to Polk County and come to the whitewater center and soak in that moment of what that meant for them to win that first Olympic medal there. That's pretty cool. "Everyone has stories. I remember so little about the results, but I remember the race, the fans. It was a big crowd, and they really honored every athlete's moment." Jacobi and others like Mayers, who coaches in the Nantahala Racing Club, will tell you those two days and the years leading up them were great for Polk County, but that the river soon went dry. "The year after, in 1997, I don't think there were any releases of water at all on the Olympic section," Mayers said. Water is scheduled to be released on the Upper Ocoee on Saturdays and Sundays through Sept. 17 this year. Those releases attract plenty of paddle sports enthusiasts, although more business comes in to the local economy through rafting expeditions on the Middle Ocoee, where water runs throughout the week. In total, the Ocoee River's whitewater scene generates more than $43 million annually in economic activity for the area, according to a University of Tennessee study. But no major competition has come to the Ocoee since a 2001 World Cup was canceled after the Sept. 11, 2001, terror attacks, and organizations like the Nantahala Outdoor Center in Bryson City, N.C., have chosen to make their largest investments elsewhere due to what many paddling enthusiats perceive as apathy toward the activity in Polk County. "An hour to the east is the Nantahala River," said Jacobi, who is affiliated with the NOC. "They have hosted so many international events without having had the Olympic games. The NOC brought a professional events staff with them. We've hosted two world championships since 2013 and other international events, not to mention tons of enthusiast-level events as well." Firestone, who is in his seventh term as mayor, agreed that the Ocoee has been underused. "After the Olympics, for whatever reason, we couldn't get corporate sponsors — and I can't identify all the problems — but we have some things that we can't do. Fundraising, it's publicly owned, and you've got to go through TVA and the Forest Service, so most of those competitions we've lost have been to the Nantahala, where we don't have the restrictions we have here. It's disappointing." Mayers works with young kayakers, bringing them to the Upper Ocoee to test their skills in the place where the world's best once gathered. He is working to bring world-class events back so that the next generation of whitewater paddlers will know the Ocoee for what it was in 1996. "It was amazing," Shipley said. "That community has had a tough time. The mines were shutting down at that point in time, and in spite of all the hardships and tough times economically in that area, everybody stepped up and hosted us. "The hospitality, the reception, the people and the culture that we met and learned there were amazing. It was much more foreign to a foreigner than just average America."